I did a video and photo tutorial for this look so you can see the motions but also get the step-by-step look and some additional photos here in the post. Before we begin, I had some questions about my hair cut. It's just cut straight across (or as straight as my husband could cut it a few weeks ago! ), all one length, no layers. My bangs are nose length and it's naturally oily and is color treated. My hair is very straight and it doesn't take to a curling iron or hot roller very easily so I used pin curls for this tutorial but you don't have to! Use whatever curling method works best for your hair, be it hot roller, foam rollers, curling iron, etc. 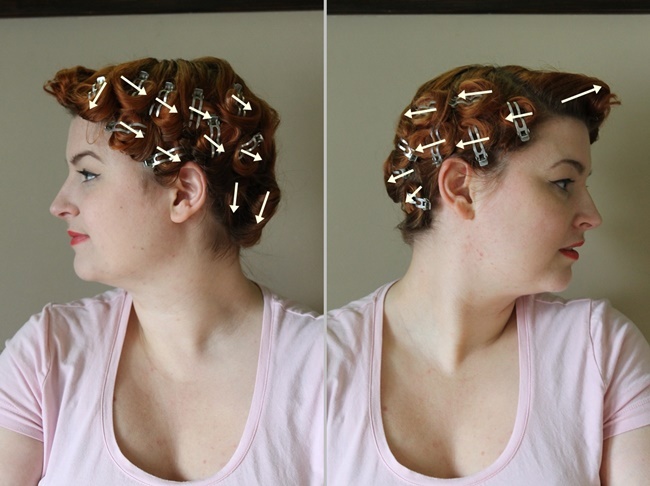 If you're interested in trying pin curls like I did here, this is the pattern. Feel free to change it according to your hair thickness and type. If you use rollers, roll it all downwards, following the same placement as the pin curls and using the smallest roller size. If you need help with pin curls, check out my tutorial, Pin Curls 101 for tips I've learned over the years and a video on how to roll and brush out your pin curls. These clips shown below are vintage, found on Ebay. They're called "Bell Professional Pin Kurl Klasps" or "Bell Professional Kurl Klasp Kit". The dent in the middle of the clip is supposed to prevent dents in your pin curls. I've searched for a modern equivalent but there's nothing quite like these on the market. I did find these padded pin curl clips on Amazon that may be worth checking out but you can use regular pin curl clips or bobby pins. I've always had good results with both. Oh wow, I need to do my nails immediately after writing the post. Eh- life of a girl who hand washes her dishes! Anyway....Now my hair is generally brushed under all around and it's not so wild so we're ready to really start forming the shape of this style. Now for the dent! Special thank you to the beautiful Lindsay Lane for her tips on getting the dent shape here. I tried all kinds of methods found on You Tube videos but her tips worked the best! Start at the top of your head and brush straight down, stopping at the base of your skull. Do this all the way around your head, stopping where you want the dent to be. You can use a comb for this, if you like but I'm using the soft bristle brush to help smooth the hair out. Now that you have a dent, you'll notice the curled- under ends are a little messy. Just repeat brushing the hair under and use your fingers to spread the hair out into a continuous curtain. If it separates use the brush to gently comb over that section. It's a fiddly hairstyle so I just keep messing with it, shaping the curl and brushing down to the dent until its just right. If you part your bangs off to the side like mine, section it off and backcomb a bit to give it height. Sometimes I'll hit it with some dry shampoo to keep it really high but eh-not today. Smooth it out with the soft bristle brush and comb it under to match with the rest of the curl. This is a perfect style for a girl with Bettie bangs or faux bumper bangs too! Hit it with some hair spray and use some pomade or anti frizz cream to smooth out the fly-aways and you're ready to go! 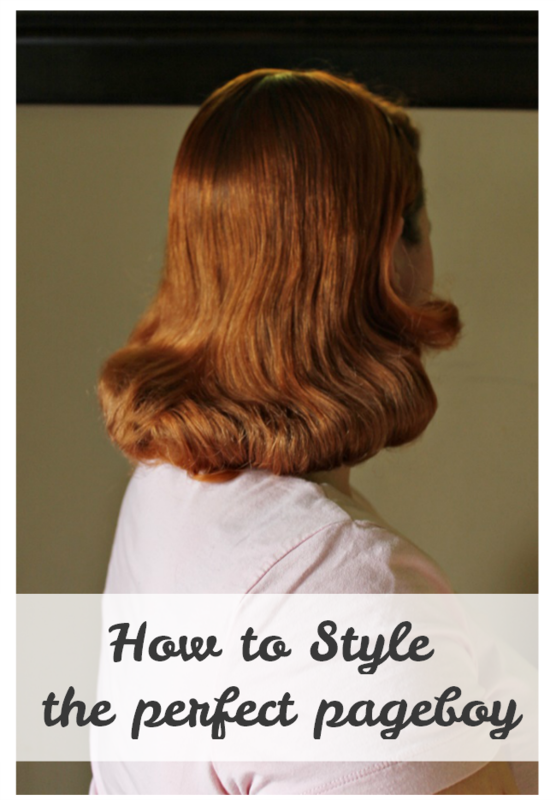 This style lasts all day for me when I use pin curls. I don't wear this look when I know I'll be in the heat or rain for a long time but for a regular day mostly indoors or a really nice, not too windy day, it's perfect. In the evening, you can roll it or re-pin again without getting it wet and it'll be easy to brush out and style for a perfect day two pageboy. Those vintage clips are so neat! Awesome style and tutorial. I love that your DH sometimes cuts yours hair. Tony used to do for me, too, in my pre-wig days and is the one who has shaved what remains of my real hair head every time in years since. There's something so sweet and intimate (and trusting) about having your husband help you out in that sort of way. You just make it look so easy! Thanks. My BF also cut my hair - After a WWII diagram. We put on some nice 40s jazz tunes and have fun with it. Oh did he?! That's amazing! I asked my hubs to cut the middy after watching a video and he was like "no way! I will screw it up so bad!" Lol! So I figured Id just have him take off a few inches for me till I can get to my stylist. He was terrified the whole time but I said its ok, its just hair! Haha! Ooh, I like this tutorial. Very glamorous! Many ways to accessorize as well. I've tried a number of different sets on my hair, and I like this one the best, thanks for sharing! My hair doesn't hold curl, but I've found with Lottabody setting lotion and a wet set with foam rollers, I can get curls to last all day if there is no humidity. This is a versatile set as well, I brushed mine into curly waves rather than a sculpted page boy. Also, I cut my hair into a longer middy using an online tutorial where you part the hair into four parts and separate them into low ponytails to cut. I am a huge fan of day in the life posts! Thank you! THANK YOU! Thank you thank you thank you thank you thank you. I have been trying to figure this out for an age now (I never *quite* get there with the dent) and had not yet found a decent tutorial. You're amazing! Amazing! Thank you for posting this tutorial. What I appreciated most was you began with the haircut description. You are in the 1% that actually explain that! Lastly, you were articulate with all the steps. You are kind as you are beautiful! as the hairdressers would always cut it in a blunt bob, that I couldn't do a thing with. I really admire your vintage ability with fashion also ..